Designing a hallway can be a challenge at the best of times, but if yours is smaller than average, you'll need some clever tricks up your sleeve to make it feel as big and bright as possible – all while trying to cram in some stylish touches, of course. Use these clever design ideas for small hallways to help yourself think big. Looking for more pratical advice on how to design a hallway? Check out our dedicated feature for answers to those all important hallway questions. Narrow shoe storage units with hinged drawers that tip out, like this Stall unit from Ikea (on the right of the hallway), are great for narrow hallways, and the surface gives you somewhere to pop keys or post when you come through the front door. Two have been placed side by side for optimum storage opportunities. Find tons more hallway shoe storage ideas in our guide. We love this idea of partially removing the wall between the hallway and lounge, creating an open-plan feel, while still having wall space for coat and shoe storage. Want to give this whole open plan living thing a go? Find out everything you need to know about creating an open-plan layout in your home. Just because you have a small hallway, doesn’t mean it has to lack character. Paint a wall with blackboard paint to give you somewhere to write messages and reminders, use the space above doors to hang shelves for books, and hang a pegboard, like this one is by Kreis Design, with a mixture of hooks and shelves, to provide a range of small storage options. If you want to try out this look, it's actually a really easy DIY jobbie. Just check out out guide to how to create a chalkboard wall, (spoiler: with chalk paint). Keep small hallways clutter free and organised with a selection of hooks, shelves and an umbrella stand positioned by the door. And, if space permits, a small bench like this one from Garden Trading will provide storage as well as giving you somewhere to perch when pulling on your shoes. 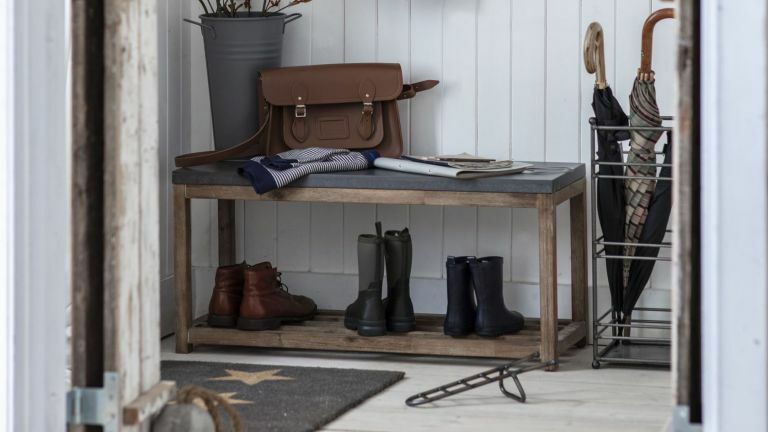 Find more hallway storage solutions in our buyer's guide. Unlike a standard hinged door that requires floor space to swing open, a sliding barn door takes up little more space than the thickness of the door. These sliding doors feature a very simple mechanism, which, if you’re a competent DIYer, are easy to install. Because barn doors slide and hang to the side of the door, you will need to make sure you have wall space to slide the door across. Find a selection of rustic and modern traditional barn style tracks at Ironmongery Direct, Screwfix, and SDS London. Transform your hall into a welcoming entrance with String’s multi functional modular furniture, which can be customised to work for your space. The system can accommodate a variety of different storage solutions, including hooks for coats, shoe racks, and a bowl shelf for your keys, which is made from felt to minimise noise. Mirrors in narrow rooms are particularly effective, making the space feel almost twice its size. Have one made to measure so that it covers the whole wall (this will help the visual effect of lengthening and widening the space), and, where possible, place near a window to reflect light from outside. Room design by Brown Architects. Find more hallway mirrors in our buyer's guide. Add personality to your hallway using flooring with a geometric design. Choose one with a diagonal pattern to trick the eye into seeing a narrow space as wider. Choose the best hallway flooring for your home with our guide. Utilise the space under your stairs with built in storage cupboards. Pull-out storage drawers like these from Avar Furniture are a brilliant way of introducing lots of storage in your hallway and can be used to stash anything from cleaning equipment, to coats, to children’s bikes and toys. Find tons more ideas for under stairs storage solutions in our guide. Just because it’s small doesn’t mean it can’t be striking. Check out @trollsteinen_interior's hallway: with bold stripes, painted in wide bands of black and white, which she’s teamed with a neat black bench and peg rail, and some lush green foliage, it's packed with character. Plus, the horizontal stripes make the room exaggerate the walls' proportions. Small hallways need good lighting to look their best at night. Ideally, choose a combination of lighting types: bright overhead downlights to create a feeling of daylight in otherwise dark hallways; characterful table lights for atmosphere only; and lights in skirting boards to light stair risers (and exaggerate the stairs' width). Find out how to plan the best lighting for your hallway with our guide. Small hallways can sometimes lack the natural light you need to make them feel as big as possible, so use all the tricks up your sleeve to lighten your hallway – from hanging mirrors (tick) to choosing pale paint colour schemes. Find more ways to lighten your hallway in our guide and browse the best hallway colour schemes, too. Carpet below by Cormar Carpets. Hanging wallpaper with a subtle stripe will exaggerate a hallway's proportions: choose a horizontal stripe to make it feel longer or wider; pick a vertical stripe to make the hallway seem taller. The Emilia from Sandberg takes its cue from Breton stripes and will complement a contemporary home with nautical accents. For more hallway wallpaper design ideas, check out our feature. We know we bang on about gallery walls, but what's not to like: they're easy to create, add bags of character and take up no space. Plus, if you choose light coloured frames and prints, your hallway's proportions will be flattered. Find how to create your own gallery wall – and be inspired by our photo and picture display ideas. Saving space and letting in light are the two must-dos when designing a small hallway. Window film is a super-affordable way to create instant privacy, but interest, too, without having to invest in window dressings. Window film by The Window Film Company. See more wonderful window film ideas in our design gallery. Didn't think you had room for any book storage in, say, a narrow hallway? Think again. This book shelf has been built into a door so it doesn't take up any extra space. We are sure you could DIY this kind of thing but if you aren't up for the challenge, a carpenter or joiner would be your best bet. Find more brilliant book storage ideas.